This afternoon, the colors red, white and roan were prevalent in the American Royal’s Hale Arena. 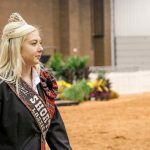 Shorthorn Lassie, Tejlor Strope, paraded the cattle through the ring in her plaid tartan and blazer, the official Shorthorn Lassie attire. Many people question the meaning of the Shorthorn Lassie outfit. The answer to the question is about the Shorthorn heritage. According to shorthorn.org, the outfit is made up of a kilt, tartan, plaid sash, and a blazer. Much of the outfit originates from the Highlands of Scotland. 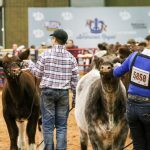 The Shorthorn Lassies are celebrating 61 years in existence. 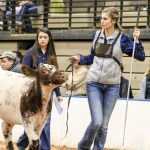 The National Shorthorn Lassies serves as the women’s auxiliary of the American Shorthorn Association. 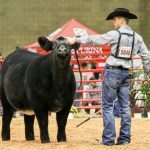 “Its been a really good opportunity to serve as an ambassador for the breed and represent Shorthorn cattle,” Strope said. The Shorthorn and Shorthorn Plus shows were sorted by judges Scott Bayer of Wisconsin and Blake Nelson of Missouri. Bayer and Nelson are both heavily involved in the cattle industry. 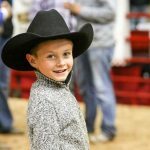 Nelson is the current Executive Secretary of the American Maine-Anjou Association in Platte City, Missouri. Bayer and his family own and operate TC Reds in Ringle, Wisconsin, where they raise both Angus and Red Angus Cattle.